Whispers from the Limit of Space, 2015, Wood, acrylic, bamboo, paper, and Dacron, 40.5 x 34.5 x 8 inches. The Transit of Uneven Gravities, 2015, Oil on linen, 20 x 18 inches. Through a Tholin Haze, 2015, Wood, acrylic, bamboo, paper, and Dacron, 22 x 17.5 x 8 inches. Through the Curve of Binding Energy, 2015, Oil on linen, 20 x 18 inches. The Time Machine I and II, 2015, Wood, acrylic, bamboo, paper, and Dacron, 22 x 17.5 x 8 inches (each piece). The Scale of Worlds, 2015, Wood, acrylic, bamboo, paper, and Dacron, 54 x 47 x 8 inches. The Evaporation of Unseen Planets, 2015, Oil on linen, 47.5 x 39.5 inches. The Atomist, 2015, Wood, acrylic, bamboo, paper, and Dacron, 22 x 17.5 x 8 inches. The Accidental Geometry of Optics, 2015, Wood, acrylic, bamboo, paper, and Dacron, 42 x 35 x 8 inches. Super-Robots and Celestial Mechanics, 2015, Oil on linen, 48 x 48 inches. Slow Zooms, Persistent Histories, and Ballistics, 2015, Wood, acrylic, bamboo, paper and Dacron, 66 x 60 x 8.25 inches. Radio Echoes, Farewells, and Pale Projected Light, 2015, Wood, acrylic, bamboo, paper and Dacron, 22 x 17.5 x 8 inches. On the Edge of Forever, 2015, Wood, acrylic, bamboo, paper, and Dacron, 54 x 47 x 8 inches. Neutron Star, 2015, Wood, acrylic, bamboo, paper, and Dacron, 66 x 60 x 8 inches. Corridors and Hallways Under the Electron Cloud, 2015, Wood, acrylic, bamboo, paper, and dacron, 66 x 60 x 8 inches. Burnt by the Glare of the Local Sun, 2015, Oil on linen, 20 x 18 inches. Confined Orbits and Super-rotations, 2015, Wood, acrylic, bamboo, paper, and Dacron, 22 x 17.5 x 8 inches. 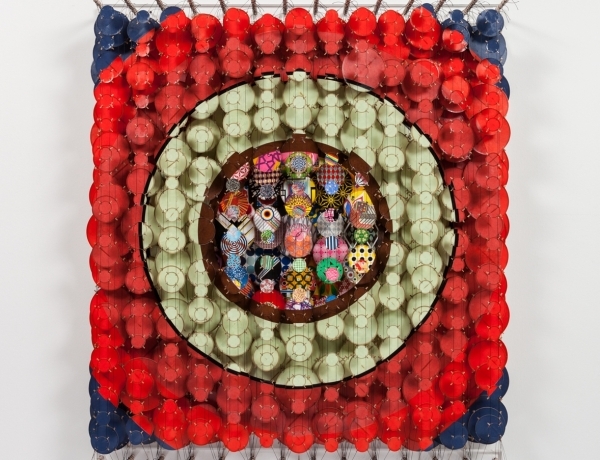 Jacob Hashimoto, Neutron Star, 2015, Wood, acrylic, bamboo, paper, and Dacron, 66 x 60 x 8 inches. In the Cosmic Fugue is Rhona Hoffman Gallery’s fourth solo exhibition of Jacob Hashimoto’s enormously imaginative and laboriously created work. The show will occupy the entire gallery with four new oil paintings and twelve sculptural “kite” pieces, which are created from Hashimoto’s signature medium of innumerable, individually arranged rice paper and bamboo “kites.” These visually striking, multi-dimensional works engross viewers through their organizational and geometric complexity, changing sight lines, and sheer beauty. With In the Cosmic Fugue, the expansive and effervescent nature of Hashimoto’s work becomes more tightly organized and contained by bold visual graphics. His aesthetic inspiration stems from the space race era and 1960s California “Hard-edge” Abstraction. Unlike flat, High Modernist paintings; however, Hashimoto’s crisp lines fracture and transform as viewers move around his three-dimensional works. A concern with space has always figured prominently in Hashimoto’s thinking, and In the Cosmic Fugue employs graphically minimal means to capture the cosmos’ vastness and infinite possibilities. 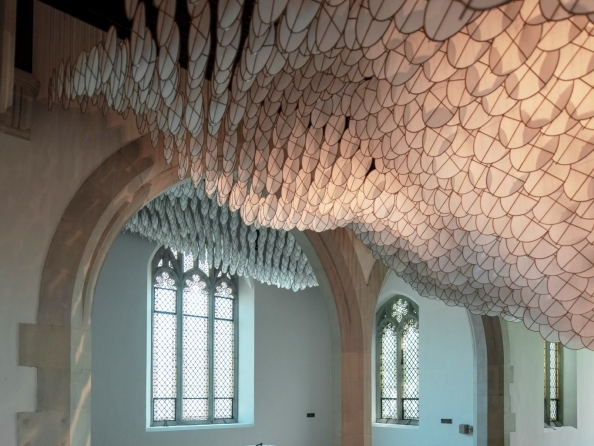 Jacob Hashimoto (b. 1973, Greeley, Colorado) received his BFA at the School of the Art Institute of Chicago and currently lives and works in New York. Previous solo exhibitions include the Museum of Contemporary Art Pacific Design Center, Los Angeles, California; Museum of Contemporary Art, Chicago, Illinois; Museo d’Arte Contemporanea di Roma (MACRO) in Rome, Italy; Nevada Art Museum in Reno, Nevada; Palazzo Fortuny in Venice, Italy; the Bildmuseet in Umeå, Sweden; Querini Stampalia Foundation in Venice, Italy; Rice University Art Gallery in Houston, Texas; and a site-specific installation at Schauwerk Sindelfingen, The Peter Schaufler Foundation in Sindelfingen, Germany.